Fabulous Summer Bridge trip in an 18th Century Manor House with your hosts Zebedee and Claudia Stocken. Fully booked - contact us to join the waiting list! The perfect chance to combine bridge, culture, wine, tennis, golf , fishing and much more in beautiful surroundings. 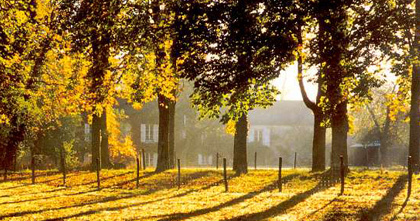 Burgundy is a hidden treasure with so much to offer, giving you a taste of the real France. Aside from learning and playing bridge, there is so much to see and do at La Maison de Chateau. This beautifully restored 18th century manor house is set in its own 24-acre park bordered by the wooded banks of the river Armancon, on the edge of the quiet village of Cry-sur-Armancon. September is one of the best and most popular times of year to visit La Maison du Chateau where there is a hint of magic as you enter the magnificent park with its avenue of chestnut trees, walled garden, ancient stone wood house and pigeonnier. The heat of the summer offers gentle warmth to the days, allowing for wonderful walks along the canal, and even a refreshing dip in the pool after a game of tennis on the hard court. The house itself has a warm welcoming atmosphere. The 11 bedrooms (all with en-suite or private bathrooms) are spread out over the main house, barn and the gatehouse, which is nestled up against the gateway to the park. We will be playing bridge in the music room, above the old stables, with wonderful views over the park, now with a wood-burning stove to make the room really cosy. The house is situated just a few hours drive from Calais or on a TGV train line from London Waterloo to Montbard, which is the local town, 15 minutes away. We ran two wonderful trips here in April 2012 and September 2013, click here to see photos and read all about them. 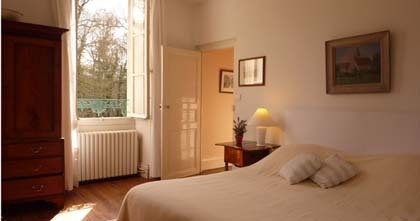 For more information about La Maison du Chateau, please click here to visit their website. They also do wonderful painting and wine-tasting weeks there, and it is also a perfect setting for a family holiday. Aside from learning and playing bridge, you could spend your whole time exploring the beautiful grounds. You can row the boat to the private island, go fishing, play tennis, swim in the pool or just relax and settle into the amazing location. We are also running two excursions . There are also golf courses within driving distance and many beautiful and historic towns and villages close by. If you would like to book, please first contact Claudia by email to check availability and to reserve your room provisionally. Then download the booking form, and send or scan and email this to us, together with the deposit (via bank transfer or cheque). We will then email your confirmation. 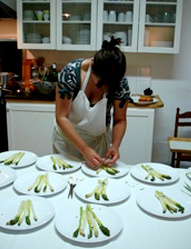 The food will all be freshly prepared by wonderful local chef, Delphine. Delphine successfully combines authentic French cooking with fresh, high quality produce - show-casing the best of the region. Whether it be for a super-tasty buffet lunch, picnic by the river, delicious cakes for tea or fabulous three-course dinner, we are certain that you will find her cuisine outstanding.